The Islamist Invasion of EU (2 of 2) – Wake Up! Wake Up! The invasion in Europe carries with it problems associated with immigrating Muslims. Not all are terrorists, but it only takes a few. Also the history of Muslims living in the EU has not been favorable towards host countries as they have been subjected to attacks on their freedoms and laws by the more fundamental Islamists. They seek changes to the national identity of the host to accommodate Islam and the insensitivities of the more ardent followers to any criticism, concern, dissent, resistance or even depiction of an Islamist or their example. The immigration problem is overwhelming the members of the EU and causing many, whose hearts are open to new-comers, to think again as the tide is rising more like a tsunami than an expected flow. The presence of just a few terrorists makes the situation even worse as one looks to the tactics of the likes of ISIS to spread their barbaric ideology to other parts of the world. Europe has become an easy access point. With black gold gushing after the end of WWII, Saudi Arabia and Iran, among other Muslim Nations, began to emphasize, using their Allah given wealth, their ideology and seek ways to expand beyond current borders. Oddly, though, a need for employees in Europe, where populations were not increasing sufficiently to maintain growing economies, turned towards Turkey, Algeria, Pakistan, and elsewhere, with invitations to come and work. Those countries offered the best potential for persons willing and wanting to work. It was to be temporary, but that has not been the case. Also these invitees decided to maintain their identities, the hosts not insisting they assimilate. The invited legal immigrants were not required to learn the language, study the history and habits, and embrace their new nationalism. This, I believe, was and remains a grave error in political judgment. Left alone they were emboldened to insist they have a place in this new society and that it adopt and accept their requirements. They were encouraged to maintain their cultural heritage by outside influences from Muslim dominated areas who funded their isolation. Over time it has become problematic. Not all of the Muslim invited in as workers coveted a passion for Islamism, but enough have. Isolated pockets, in some cases significant enough to become ‘no-go’ areas where non-Muslims fear entry (even the police), have created a force against the establishment of the host country and seek changes in common law to be more Sharia compliant. The social problem Muslims have created in many areas of the EU, think again ‘no-go’ zones, has become a warning. The Muslims were assisted in their ability to remain independent by the politically correct thinking of mis-informed, un-educated politicians. The liberal mindset still believes Muslims are innocent of terrorist actions. The presence of this fanatical ideological cadre of individuals taking on the established order of countries like Britain, France, Sweden, Germany and so forth, making demands to accommodate the laws of Islam, has become as a billboard announcing the arrival of Allah. Quoting a leading Islamist, Maududi (dead), “Islam wishes to destroy all States and Governments anywhere on the face of the earth which are opposed to the ideology and program of Islam regardless of the country or Nation which rules it….” The insecure, overly, and overtly, sensitive nature of Muslims, the more strict, crying out ‘persecution’ when the slightest offense is considered, has become a frustration. They have no substance. 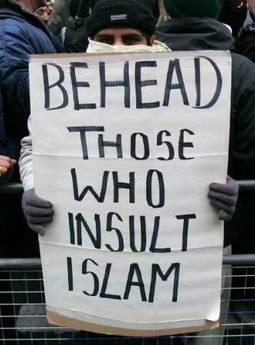 There is an irony to Islam reflected in the nature and barbaric habits of leading fundamentalist groups such as ISIS, Taliban, Boko Haram, Al Qaeda, Al Shaabab summarized as, ‘If you continue to call Islam violent, we will have to kill you.’ Placards carried by British Muslims reading, “Behead those who say Islam is violent.” have been seen too often and by too many as a reminder of this encroaching cancer on the EU. Omar Ahmad, founder of the Council on American-Islamic Relations (C.A.I.R. ), who call themselves a moderate group, said in a speech in California, “Islam (should be) the only accepted religion on earth.” Another placard bearer claimed, “Islam will dominate the world.” This also was displayed in the UK. More of this, and more frequently, is not what the residents of the EU want to see. But they probably will. The enemy needs to be identified to be defeated. Communism was identified. Naziism was identified. Fascism was identified. All became targets to be defeated as they destroyed the fabric of any free nation where common law is intended to protect all people, not just one religious group or strict followers of the nations leaders as if they were gods. Nationalism can go to far, but not if it is objective and respectful of all people. The case for Islam today – it is an ideology like those mentioned that targets freedom as if it were a sin. Those who are supporters of Islam must do so without any consideration of third parties, Kafirs, who may criticize or dispute the ideology – critical and thus seen as persecutors. They are to be destroyed, and eradicated, so the men wearing the cloth of Islam can dictate. Muslims are not hiding their agenda. When they enter free nations they take full advantage to advance their laws (not those of their hosts). Muslims are instructed to live among hostiles and await their time. No love of neighbor, but avoid notice and seek acceptance. (Sura 4:36) It is a political movement, political Islam, a revolution seeking openings to advance their objective of a world All for Allah. Sharia is their Constitution and they intend it to be everyone’s Constitution – even yours. And they act as if god (Allah) is directing them and they are acting on his behalf. The Biblical God, if you think Allah and God are the same, does not ask man to do his bidding. Judgment and punishment are His alone. Islam is the enemy of anything that is not Islamic, at its most fundamental roots. Even those who loved the culture, but not the idealism, will find themselves in the crosshairs of the AK-47’s representing the voice of Islam today. They question calling themselves Muslim – as they should. If they love God, then love God, but not Allah. The Bible will set them free. The taking of Europe has been made easy. It can be seen, understandably so, as a wave in the advance of Islam throughout the world. They are cheering in the halls of the mosques in Mecca and Medina, in Tehran and elsewhere, as a historical barrier to the advance has been broken. Even if not started by Saudi Arabia or Iran, even if the invasion is a plan of ISIS, it will be supported by the fundamentalists of Islam worldwide. Their oil stained pocketbooks will be open to the spread of Islam in the western and free areas of the world. Beware of those who offer to build a mosque in your neighborhood. Beware – An invasion is underway. Prepare. Do not let your guard down. Understand Islam. Know what it can do to you and your family. Even moderate Muslims who loved Allah but were never strict in their belief realize now the fundamentalists have gone to far, and if indeed they are right, then the moderates are not Muslims. Why, because they were willing to be tolerant and accepting of others. Because they believe in the common good may they realize they are God’s children, not Allah’s. Pray and be prudent is your actions.